In this Photoshop Effects tutorial, we're going to look at how to easily create a Photoshop puzzle effect, allowing us to turn any photo into a jigsaw puzzle! Or at least, we'll be creating the illusion that the photo is made up of small puzzle pieces, although I suppose you could print the photo afterwards, cut around all the pieces with scissors and make an actual puzzle out of it, but as I like to say, why fumble around with reality when faking things in Photoshop is so much easier. As we'll see, much of the work for our puzzle effect has already been done for us thanks to Photoshop's Texturizer filter and a free texture that Photoshop ships with, although we'll need to load the texture in ourselves, which we'll learn how to do. We're going to take things a bit further than that, though, and see how to make it look as if some of the pieces are still missing, giving our puzzle a "work in progress" appearance. I should mention up front that while this photo effect is very easy to do, some of this tutorial involves using the Pen Tool, and since explaining how the Pen Tool works in Photoshop would require its own separate tutorial, I'm going to assume here that you're already familiar with how to use it. The good news is, the Pen Tool does have it's own separate tutorial, so if you do need help with the Pen Tool, be sure to check out our complete Making Selections With The Pen Tool tutorial which you can find in our Photoshop Basics section. The same image after applying the Photoshop puzzle effect. The Layers palette showing the newly created "Layer 1" sitting above the Background layer. 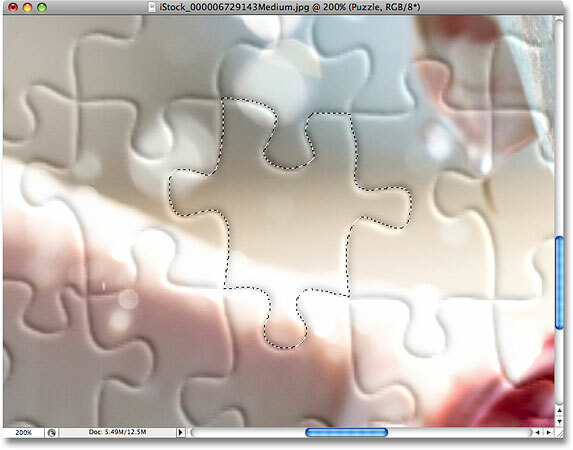 Step 2: Rename The New Layer "Puzzle"
Change the name of "Layer 1" to "Puzzle". Press Enter (Win) / Return (Mac) when you're done to accept the name change. 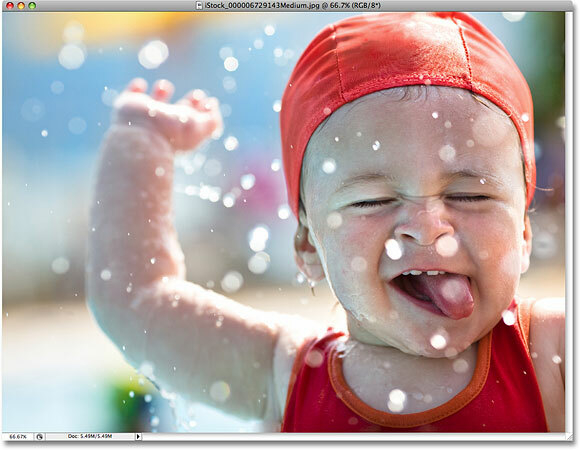 Hold down "Ctrl" (Win) / "Command" (Mac) and click on the New Layer icon in the Layers palette. 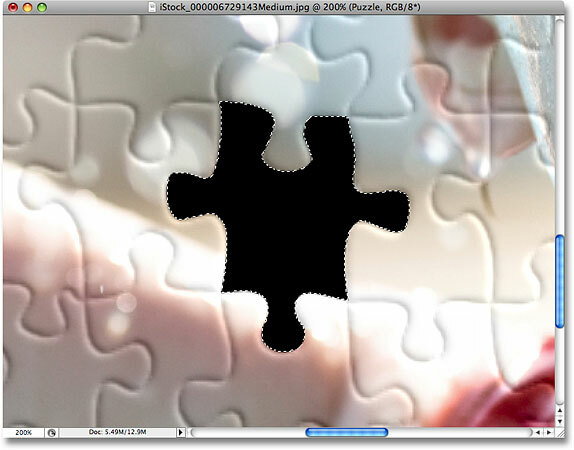 A new blank layer appears between the "Puzzle" and Background layers. Set the Contents option to Black. The layer preview thumbnail for "Layer 1" now appears filled with black. Rename the new layer "Background color". Click on the "Puzzle" layer in the Layers palette to select it. We're now ready to convert out photo into a puzzle! Go to Filter > Texture > Texturizer. Click on the small arrow to the right of the Texture selection option, then select "Load Texture". This opens the Load Texture dialog box, allowing us to navigate to our texture. The "Puzzle" texture we're looking for is located inside the Photoshop directory on your hard drive, wherever you happened to install Photoshop. On a PC (Windows), the default install location is on your C: drive, so first navigate to your C: drive, then open your Program Files folder. Inside the Program Files folder, you'll find an Adobe folder, and inside the Adobe folder, you'll find your Photoshop folder. The actual name of the Photoshop folder will depend on which version of Photoshop you're using. So, for example, if you're using Photoshop CS3 as I am here and you installed Photoshop to the default location, your Photoshop folder will be at C:\Program files\Adobe\Photoshop CS3. On a Mac, things are a bit easier. You'll find your Photoshop folder inside your Applications directory on your hard drive. Again, the actual name of your Photoshop folder will depend on which version of Photoshop you're using. 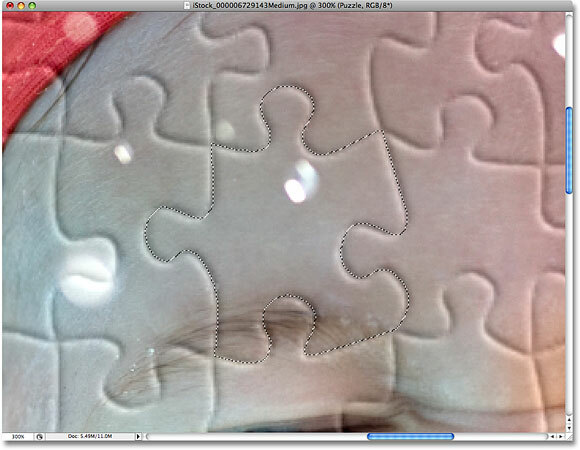 Navigate to your Texture folder inside your Photoshop directory, then select the Puzzle texture. Adjust the options for the Puzzle texture, using the preview area on the left of the dialog box as a guide. The photo now appears divided into puzzle pieces. The basic puzzle effect is now complete, but let's take things a bit further and remove some of the pieces, as if the puzzle is still a work in progress. We'll do that next! This is the part of the tutorial where you'll need to know how to use the Pen Tool in Photoshop. The reason we'll be using the Pen Tool is because we need to be able to draw selections around individual puzzle pieces and the pieces have a lot of curves to them. You could try selecting the pieces with something like the Lasso Tool or the Polygonal Lasso Tool, but you'll most likely find that your results look sloppy and jagged, whereas the Pen Tool was designed specifically for drawing curves and will give you much better looking results. If you're already comfortable using the Pen Tool, the rest of this tutorial will be easy, since the Pen really is a very simple tool to use once you get a feel for how it works. If terms like "paths", "anchor points" and "direction handles" are new to you or you're not quite sure you understand them, be sure to check out our complete Making Selections With The Pen Tool tutorial in our Photoshop Basics section where you'll find everything you need to know. Select the "Paths" option in the Options Bar. A path is now drawn around one of the puzzle pieces. Press "Ctrl+Enter" (Win) / "Command+Return" (Mac) to convert the path into a selection. Go to Layer > New > Layer via Cut. 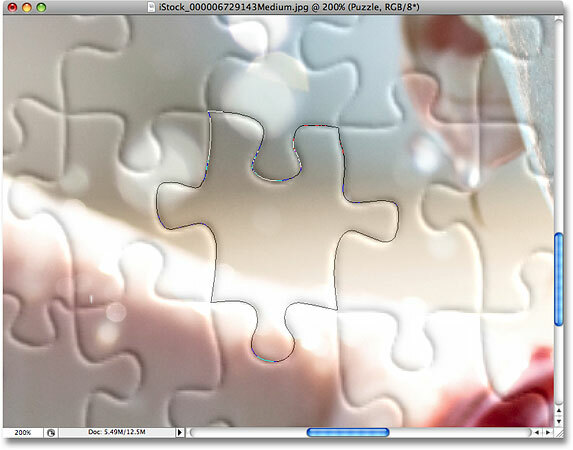 The puzzle piece now appears on its own layer above the "Puzzle" layer. We're going to make this puzzle piece look like it's about to be snapped into place. Press Ctrl+T (Win) / Command+T (Mac) on your keyboard to bring up Photoshop's Free Transform box and handles around the puzzle piece, then click anywhere outside of the Free Transform box and drag your mouse to rotate the piece. Once you've rotated it, click anywhere inside the Free Transform box and drag your mouse to move the piece away from its original location. Remember that we want it to be obvious that this piece belongs in this spot, so don't move it too far or rotate it too much. Use Free Transform to move and rotate the puzzle piece. Change the options circled in red. The drop shadow now appears to be floating slightly above the rest of the puzzle. 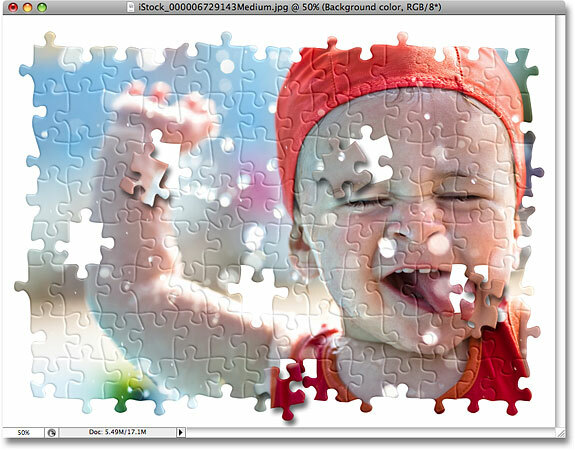 Select the "Puzzle" layer in the Layers palette. 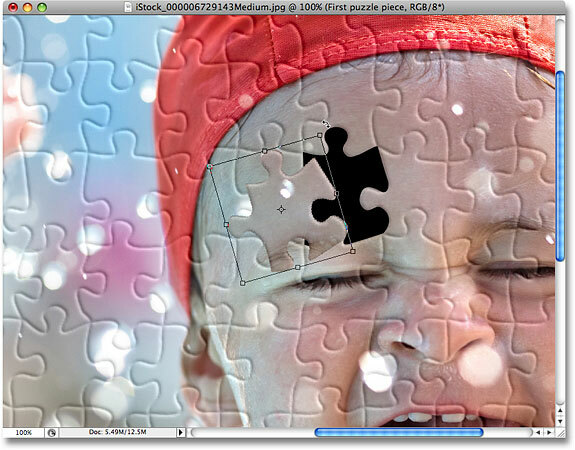 Draw a path around another puzzle piece with the Pen Tool. Convert the path into a selection. Press Delete to remove the puzzle piece from the image. Continue removing a few more pieces from the puzzle, either by cutting a piece out and floating it above the puzzle (Steps 11-15) or by simply deleting the piece completely (Steps 16-19). 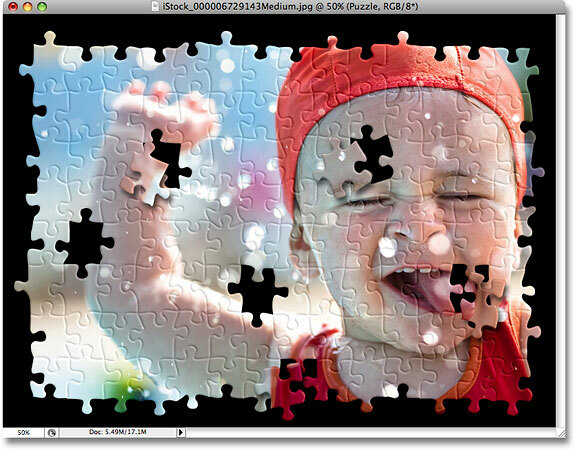 Always make sure you have the "Puzzle" layer selected in the Layers palette each time you go to cut or delete a piece. 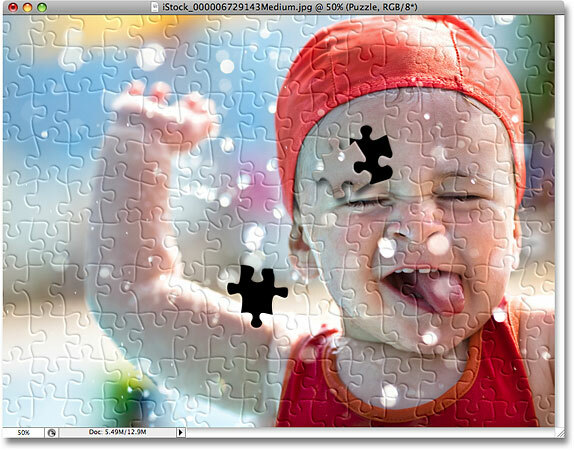 Cut out or remove more pieces of the puzzle to add to the effect. Draw a path with the Pen Tool along the inside edges of all the pieces at the edges of the photo. Press "Ctrl+Enter" (Win) / "Command+Return" (Mac) to convert the path to a selection. Go to Select > Inverse to invert the selection. The pieces along the edges of the puzzle are now selected. The edges pieces are now deleted. To change the background color to white, select the "Background color" layer, then select the Fill command from the Edit menu and set the Contents to White. The background has been changed to white. This final step is really only necessary if you've decided to use white for your background color instead of black. We're going to add a slight drop shadow to the main puzzle, and obviously, if your background color is black and the drop shadow is black, you won't be able to see the drop shadow, so you can skip this last step if you're still using black for your background. 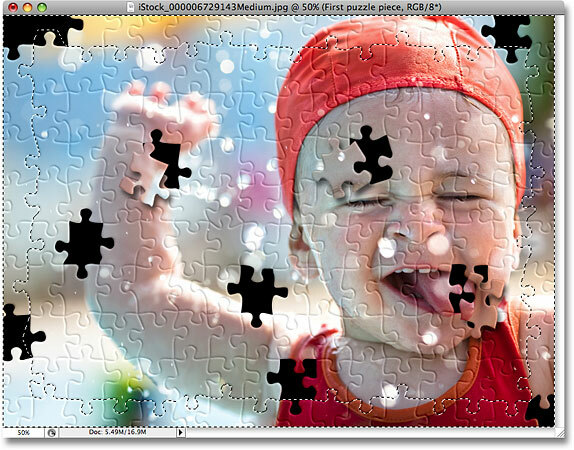 Select the "Puzzle" layer, then click on the Layer Styles icon and choose "Drop Shadow". Change the options for the Drop Shadow being applied to the main puzzle. 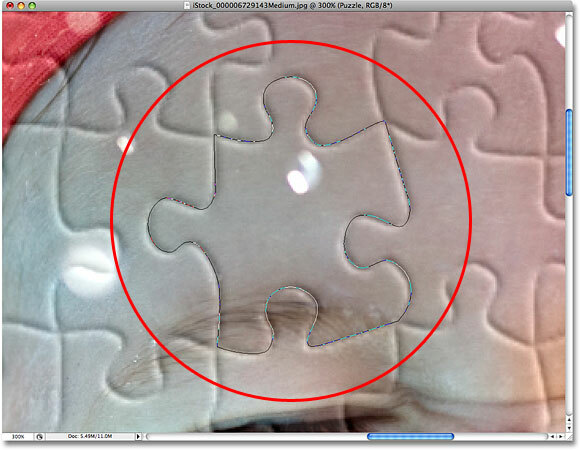 The final "Photoshop puzzle" effect. And there we have it! That's how to create a jigsaw puzzle effect with an image in Photoshop! Visit our Photo Effects section for more Photoshop effects tutorials!